As their husbands took office, what generated excitement in the society pages often was not the content of the new president’s speech as much as the gown the new first lady wore to the inauguration. 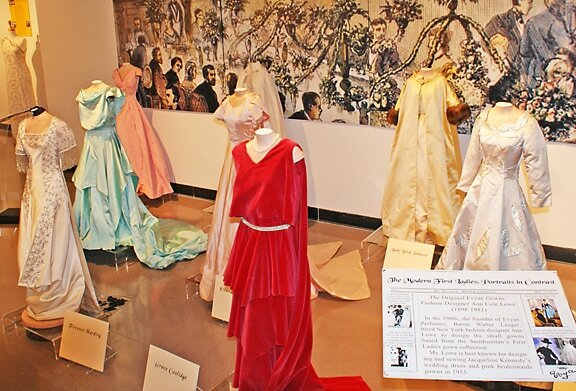 As part of the 2015 Warren G. Harding Symposium, The Ohio State University at Marion is pleased to host an exhibition of replica first lady gowns in the Kuhn Fine Arts Gallery. The Modern First Ladies: Portraits in Contrast – the Exhibit has been designed by the National First Ladies Library in Canton, Ohio. The library’s collection is based on the famous Smithsonian Institution First Ladies exhibit. The exhibition features both full-size replicas normally housed in the National First Ladies Library as well as mini-gowns from the Evyan Perfume Company collection. The mini-gowns were created by fashion designer Ann Lowe who made Jackie Kennedy’s wedding dress and bridesmaids’ gowns. The gowns and mini-gowns are displayed in the order of the presidential administrations. They include the dresses of: Florence Harding, Grace Coolidge, Lou Hoover, Eleanor Roosevelt, Bess Truman, Mamie Eisenhower, Jackie Kennedy, Lady Bird Johnson, Pat Nixon, Betty Ford, Rosalynn Carter, Nancy Reagan, and Barbara Bush. Due to the valuable nature of the gowns exhibit, the Kuhn Gallery will be open limited hours in June and July. The gallery will be open Monday, June 29 and July 6 and 13 from 2:00 to 6:00 p.m. It will also be open Thursdays July 2, 9, and 16 from 2:00 to 6:00 p.m. There will be three Friday sessions on July 10 from 2:00 to 6:00 p.m. Finally, the First Ladies gown exhibit will be open from 12:00 to 6:00 p.m. on Saturday, July 18th during the Warren G. Harding Symposium. The Kuhn Gallery is located on the first floor of Morrill Hall on the campus of The Ohio State University at Marion, 1465 Mt. Vernon Avenue, Marion, OH 43302. The Warren G. Harding Symposium, now in its sixth year, will occur July 17 and 18 throughout Marion. This year’s Symposium is titled “The Modern First Ladies: Portraits in Contrast.” The Symposium opens with a Friday evening reception at the Marion Country Club then moves to the Ohio State Marion campus for presentations on the first ladies from Florence Harding forward. Speakers include former White House Chief Usher Gary Walters and a keynote address by former United States Chief of Protocol Capricia Marshall. Registration for the Harding Symposium and a complete schedule are available at http://go.osu.edu/harding or by calling (740) 725-6253.